Google Recently Released Google Pixel 2 And Google Pixel 2 XL. Many Of You Are Not Buying It!!Right? But You Can Still Get Google Pixel 2 Launcher Or Home Screen Or UI On Any Android Device. What Do You Need To Get This Awesome Home Screen? 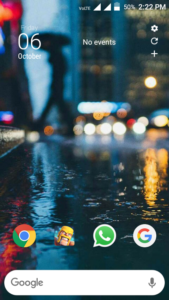 We Are Using Nova Launcher To Make Google Pixel 2 Like Home Screen. You Can Download It From Google Play Store. You Don’t Need Paid Version Of Nova Launcher Because Free Version Has Almost All Features. Second App Is Of Business Calendar 2 Which Is Required To Place A Transparent Calendar On Home Screen Because Of Google Search Bar Will Place On Bottom Of The Home Screen. Once You Install Both Apps From Play Store Then You Need Google Pixel Wallpaper. You Can Download Google Pixel 2 Wallpaper From Here. Long Press On The Wallpaper And Download It. 1.) Open Nova Launcher And Set It As Default Launcher. When You Open It First Time, It Will Ask You To Set Up Home Screen. Click Next, Next And Choose “Swipe Up” Screen. 2.) Once Set Up. Go To Nova Launcher Settings. Go To App Drawer. Scroll Down And Disable Swipe Indicator. This Will Hide The Arrow That Indicates Swipe Up. 3.) On Your Home Screen, Clear Or Remove All Apps And Folder Except Google Search Bar. 4.) Long Press On The Google Search Bar And Choose Edit. Select Round Shape Style Of Google Search Bar. After It Long Press And Drag It Down To Bottom. 5.) Again Long Press On The Google Search Bar And Choose Resize. Resize Its Width So That Search Bar Fit To Screen. 6.) Go Back Again To Nova Launcher Settings. Tap On Desktop Option. There You Have To Select “Icons And Label”. After It, Disable The Lable Option. This Will Hide Label Of The Icons On Home Screen. 6. )After It, Go Back To Nova Launcher Home Settings. Open Dock Option. Tap On Dock Background And Increase Transparency To 100. This Will Completely Transparent The Background Of Google Search Bar That You Place At Bottom Of The Home Screen. 7.) Once Done. Place Your Icons To Home Screen. Now, All Steps Are Completed Except Blank Space On Top Of Home Screen. 8.) Long Press On The Blank Area Of Your Home Screen And Choose Widgets. Head To Business Calendar 2 Widgets. Hold Down The Seconds One And Place To Top Of The Screen. 9.) Click On Allow Option To Confirm. After It, You Will Get Some Option To Customize This Calendar Widget. To Make It Transparent Go To Colors Section And Turn Opacity To 100 %. This Will Add A Transparent Calendar Widget To Your Home Screen. 1.) Go To Nova Launcher Settings. 2.) Open Look And Feel Option. There Will Be The Second Option Of Adaptive Icons. Turn On It. 3.) Turning On It Will Enable “Adaptive Icon Style”. Tap On That Option. Choose An Icon Shape And Enable “Reshape Legacy Icons” Option. 1.) Download And Install Nova Google Companion App From APK Pure. 2.) This Nova App Enables Google Now – Swipe To Open Google App. That’s It. You Can Check More Guides Here.